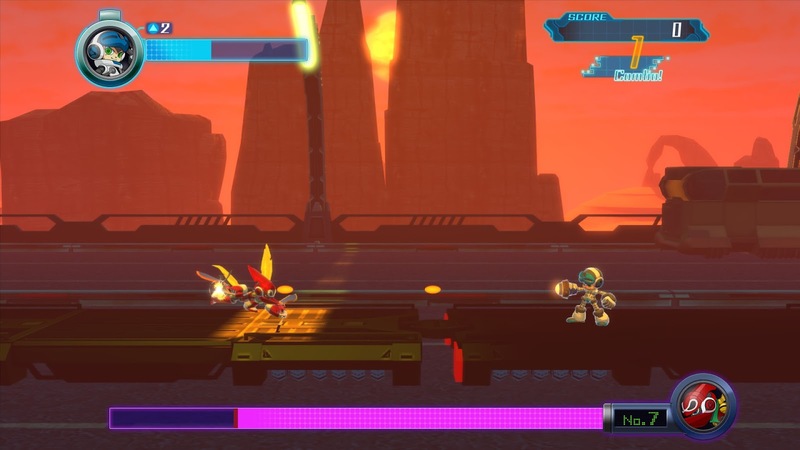 Just about everyone that has been playing games since the golden years of Nintendo has encountered Mega Man and struggled to take down the dastardly Dr…this isn’t about that game, but this is about it’s creator’s quest to bring a predecessor to the current generation through a bumpy crowd funding campaign. The drama is behind us at this point and the game is here, so let’s focus on the what has been provided to the fans and backers along with the experience. Mighty No. 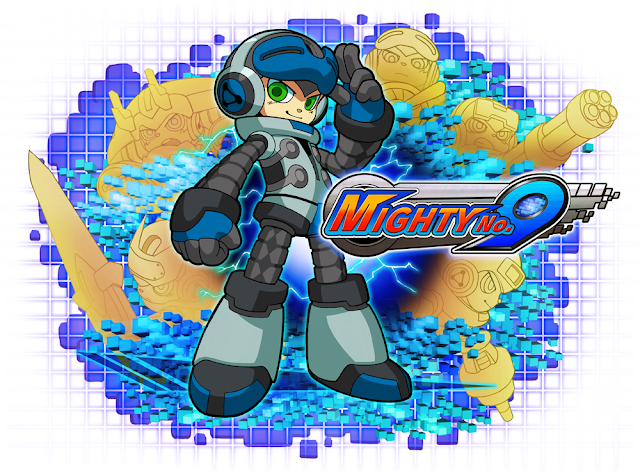 9 is a side scrolling action game in which you take on the role of Beck in the year 20XX as the ninth robot among a number others designed to compete in the Battle Coliseum; the twist is that Beck is the only one that isn’t infected by an unknown virus. Each of the robots have a unique power in which, surprise, you take over their power upon defeating. Instead of the familiar jump and shoot, a dash attack has been introduced in which bonus’ are rewarded based on timing and combos. Let’s see how Mighty No. 9 lives up to its predecessor and if that classic 2D action holds up. Right out of the gate, my experience felt slightly nostalgic and then after being introduced to the cast of characters, I got those old warm and fuzzy feelings. With each of the bosses providing a new special ability upon defeat, making selection of the next stage being strategically chosen based off newly acquired skills to help with completion of the next stage. I personally felt that Mighty No. 9 was not quite as difficult as I was expecting, however there was some stages that provided the frustrating level of difficulty that would make me set down the controller and step away after many failed attempts. There was something that stood out to me, particularly like a sore thumb were the boss character designs, they did not seem to fit in or look finished in contrast to the bright and flashy level designs and enemies. Another throwback that took me back to the patch less good old days is the music and there is good reason for that as it is the same composers, including Manami Matsumae, who have worked with Keiji Inafune numerous times in the past. While Mighty No. 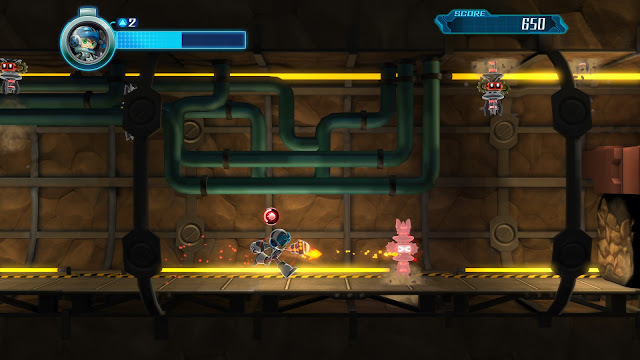 9, seems extremely linear, being a side scrolling game with 12 unique stages and boss battles, there are a number of various game modes included, which are unlocked throughout gameplay. 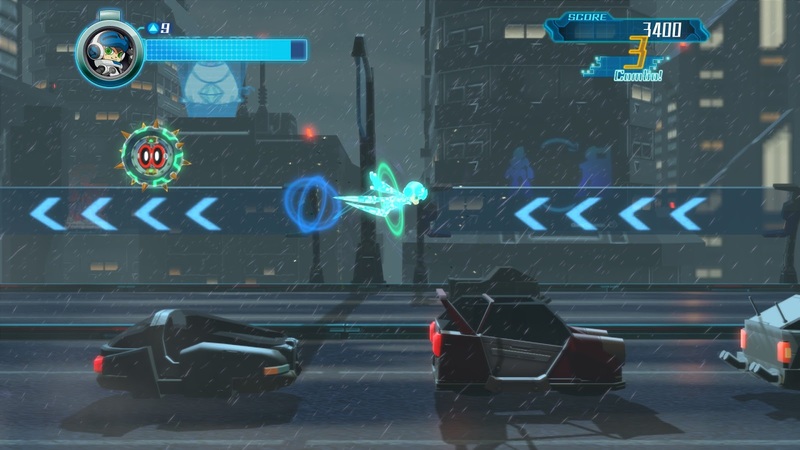 Such modes include Challenge Mode that consists of various mini missions, Boss Rush Mode to race against your best times, harder difficulties, along with 2 Player Online Race Battles and Co-Op Challenge Modes. I enjoyed most of my experience with Mighty No. 9, even though there were some gripes here and there, particularly by the main character designs and the story that I found myself skipping through cut scenes stages in. While it’s roots are definitely visible in this title, I feel that it has enough going for it to stand on it’s own and bring in a new audience that is not familiar with the previous classics of Keiji Inajune. Mighty No. 9 is available now across just about every console for $29.99.